Online currency trading is the most widely used type of binary options trading, with the foreign exchange market currently boasting a daily turnover of over $5 trillion per day, which is the highest turnover of any asset type. In binary options, online currency trading is as straightforward as it gets. If this currency pair’s rate is 1.3574, this indicates that 1 euro is being exchanged for 1.3574 U.S dollars. We’re quoting the euro with the U.S dollar being used as reference. When performing online currency trading activities, a trader speculates on the rate of one currency against other one’s with which it is paired. Let’s take the most commonly traded EUR/USD pair as an example. A rise in the pair’s market price has two possible causes: either the euro got stronger, or the dollar got weaker. A drop in the pair’s market price can only mean that the base currency is weaker than the quote currency. 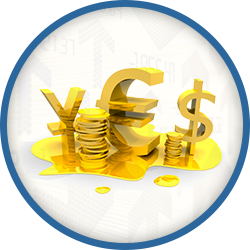 Let’s take a look at a basic example of online currency trading in binary options. A trader places a 60-second CALL option on the EUR/USD pair at a strike rate of 1.3645. This means that the trader speculates that the pair’s value will finish higher than the strike rate at the end of its 60-second expiry. If the trader’s prediction is correct and the expiry rate is anything over 1.3645 – even an ever so slightly higher rate such as 1.3646 – the trade is said to be In The Money and the trader makes profit on top of his/her initial investment. If the pair’s expiry rate is anything under 1.3645 – even by just one pip (1.3544) – the trade is said to be Out Of The Money and trader loses his initial investment. If the pair’s expiry price is the same as the strike price, the investment amount is returned to the trader with no losses or gains. This section of the website will examine the details of online currency trading as well as currency pairs, their correlations, and the factors which influence their market rates on a daily basis and on the long run, as well as various valuable trading tips and strategies.